i'm no beauty blogger, but i am definitely a beauty product consumer :) and when i find something i love, i like to share my recommendations! 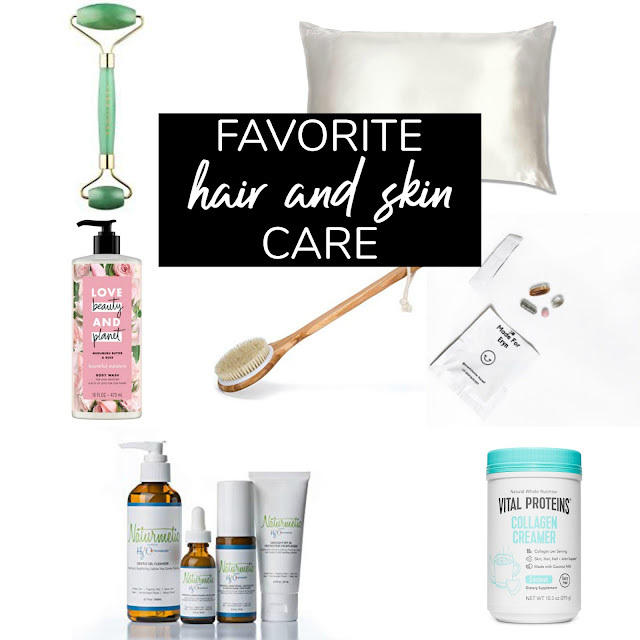 well, i've found some hair and skin care things that are working for me, so i'm here to share them with you, friend to friend! 1 // SILK PILLOWCASE the random thing i didn't know i needed but now i can't live without! did you know sleeping on a silk pillowcase is good for your hair and skin? it truly has beauty benefits! according to all the research, silk can reduce wrinkles caused by cotton, and it's better for your hair because it's anti-friction. plus it feels so fancy to sleep on a silk pillowcase. i love mine! it's comfortable and it's doing good things for my hair and skin. mine was a gift but i've seen them at Target and on Amazon. 2// JADE ROLLER this thing is so cool! literally! the jade stone stays cold naturally, and when you roll it on your face, it is known to increase circulation, tighten pores, brighten complexion, reduce under eye circles, smooth fine lines and wrinkles, and reduce puffiness and inflammation. i use mine after i wash my face, i apply my serum (see #6) and jade roll my face for about a minute. i can definitely feel a difference after using it! i found mine randomly at Ross but i've also seen them at Sephora, Forever 21, and on Amazon. 3 // LOVE BEAUTY & PLANET BODY WASH gotta love a vegan, naturally-derived skin care product that smells like a garden! Love Beauty and Planet is a holistic-conscious company. the bottles are recyclable, the ingredients they use are sustainable, biodegradable, organic, fair-trade, and ethically sourced, and they support programs that help reduce landfill waste and overall carbon emissions. and? the body wash, shampoo, and conditioner is GOOD STUFF! smells amazing, cleans my skin/hair, is safe and formulated for color treated hair, isn't toxic, and does good for the earth? yes please. i found it at Target. 4 // DRY BRUSH trust me you'll want to add 30 seconds to your bathing routine for dry brushing! not only does it feel amazing, but it also does so much good for your skin and circulation. dry brushing is exactly what it sounds like: dry brushing your body. lightly, in clockwise circular motions and towards your heart. it exfoliates dry skin, stimulates nerves, and promotes healthy blood circulation. google it! you can get a dry brush at Target or Amazon or Goop. i keep mine near the tub and use it before i get in the shower. 6 // NATURMETIC you might remember that i was using R+F skincare products this time last year or so. well, when my preteen daughter needed to up her face cleansing game, i did some more research so i could find products that were healthy for her precious skin. i found some great products for her. but my findings also led ME to make a change! i quit using R+F and i started using Naturmetic. Naturmetic products are free of parabens, fragrance, and gluten. i've been using it for almost a year and i am very happy with it! i would say their products are effective and gentle for all skin types. Naturmetic is not in stores yet, but you don't have to know someone who sells it - you just order it online. i love that the products are uncomplicated: cleanser, serum, and 2 moisturizers (one for AM, one for PM). that's it. i also love the option to have the products autoshipped because it stinks when you run out of face cleanser and have to go without until you remember to restock! so, yeah. very happy with Naturmetic! and there you have it, 7 of my current favorite beauty products! and while this is all fun and lovely, i believe that true beauty comes from within, and that unfading beauty comes from trusting God with a gentle and quiet spirit, according to 1 Peter 3:3-4.
i'll share more of my faves on instagram from time to time. see you there, lovelies!